Water makes 70% of the human body weight and 70% of Earth's surface is covered with water. This makes water absolutely critical to life on Earth as we know it ! 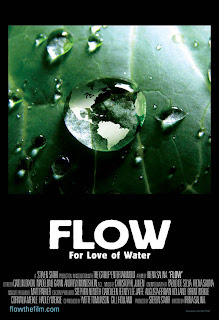 Irena Salina's award-winning documentary "Flow : For Love Of Water" is an investigation into what experts label the most important political and environmental issue of the 21st Century - The Global Water Crisis. Flow The film features interviews with water and community activists Maude Barlow, Peter Gleick scientists Ashok Gadgil, Rajendra Singh and Vandana Shiva. The film won the Grand Jury Award at the Mumbai International Film Festival. The film concentrates on the big business of privatization of water infrastructure which prioritizes profits over the availability of clean water for people and the environment. Major businesses depicted in the film are Nestle, The Coca-Cola Company, Suez (company), and the International Monetary Fund (IMF).